Shoko Asahara was the mastermind of Aum Shinrikyo, which was blamed for at least 40 deaths in attacks and tests using sarin, VX and other nerve agents. Shoko Asahara, the founder of the Japanese doomsday cult Aum Shinrikyo, which killed 13 people and injured hundreds more with sarin gas in Tokyo in 1995, was hanged on Friday along with six of his followers, the government said. Chief Cabinet Secretary Yoshihide Suga, Japan's government spokesman, confirmed the executions to The Associated Press and said authorities were taking precautions in case of any retaliation by his followers. Asahara, 63, whose real name was Chizuo Matsumoto, had been on death row since 2004, when he was convicted of multiple counts of murder after years of court battles. In addition to the 13 people who were killed, more than 1,000 others were sickened when plastic bags containing the poison were leaked on five subway lines on March 20, 1995. At least 4,000 more turned up at hospitals for treatment of anxiety and trauma reactions. It was the deadliest attack on Japanese soil since the United States deployed nuclear bombs over Hiroshima and Nagasaki to end World War II in 1945. But it wasn't the only attack Aum was responsible for. The Middlebury Institute of International Studies at Monterey, a division of Middlebury College in Vermont, which has closely studied Aum Shinrikyo, tabulates that the cult was responsible for at least 40 deaths and thousands of injuries (PDF) as it tested sarin, VX and various other nerve agents from 1990 to 2000, including a separate sarin attack that killed eight people in the Japanese city of Matsumoto in 1994. 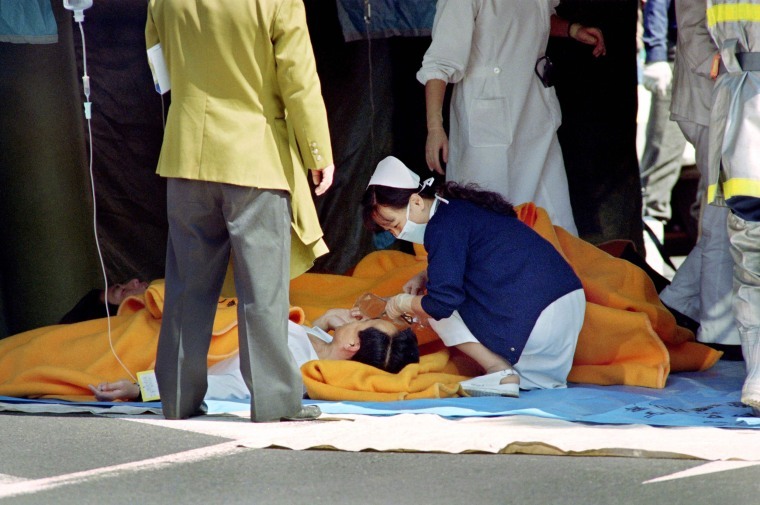 Asahara's convictions included not only the deaths of the sarin victims in 1995, but also the assassinations in 1989 of an anti-cult lawyer who was seeking to sue Aum Shinrikyo, along with his wife and their child. Asahara had been scheduled to be hanged numerous times, but his execution was delayed by a series of appeals. In 2012, his execution was again postponed after several fugitives connected to the cult were arrested, allowing authorities to extend the investigation. Six other cult members remain on death row. Shizue Takahashi, the widow of Kazumasa Takahashi, a deputy stationmaster who died in the 1995 attack, lamented that it took so long for Asahara to be executed. "If you think about those who died —in my case, my husband's parents and my own parents, who are all gone now — it's regrettable that they're not here today to share the news," Takahashi told reporters. "From the point of view of terrorism prevention, I wanted to them to talk more about this," she said. "I wanted specialists in the field to find out more from these death row convicts. The fact that this is no longer possible, well that's one regret." At a press conference in Tokyo, reporters asked about the timing of the executions. Justice Minister Yoko Kamikawa declined to comment directly, but said, "the death penalty was determined after very thorough legal deliberations through our courts." “For those whose lives were taken away, and their families, and also those who survived but have suffered aftereffects, for those victims and they families, I can’t even begin to imagine their fear, struggles and sadness," she added. Asahara founded Aum Shinrikyo — a Japanese phrase derived from Sanskrit meaning "supreme truth" — in 1984. Its theology was a mishmash of thoughts from a variety of Eastern and Western religions, including Tantric Buddhism, Hinduism and Christianity, peppered with some of Nostradamus' prophecies. Asahara gathered thousands of devoted followers, and in 1992 he declared himself Christ. If he was the Messiah, he was a narrow-minded one — at various times, he implicated Jews, the Dutch, the British royal family and the Freemasons in intricate conspiracies, which the cult publicized through the media of magazines, anime and manga, or Japanese comic books. The cult taught that the global conspiracies would lead to a third World War and a nuclear Armageddon. Only followers of Aum would survive in the new kingdom of Shambhala. At its height, the cult claimed to have 10,000 followers in Japan and 30,000 in Russia. After the subway attacks, the Japanese government stripped Aum of its status as a religious organization. It was listed on the U.S. State Department's roster list of terrorist organizations and eventually broke up into several splinter groups, the largest of which, Aleph and Hikari no Wa, are still active and are considered "dangerous religions" by the Japanese government. Arata Yamamoto and Associated Press contributed.